damage and staining. Products that you can buy at a supermarket or pharmacy can help somewhat, but over the counter whitening toothpastes and gels are not as strong and effective as professional grade treatments available through a dentist. Studies have shown that damaged and stained teeth are the feature that most people report feeling the most embarrassed and insecure about. And unfortunately it can't be chalked up to personal paranoia. People with whiter, stain free teeth are generally viewed as more confident, self assured and competent, which can affect everything from professional opportunities to social interactions and connections. 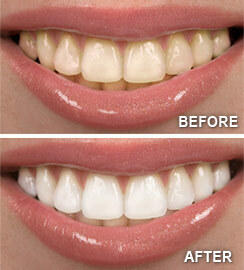 Metro Dental Associates offers two convenient methods for whitening your teeth. Depending on your schedule and personal preference, you can choice from either in-office or at-home professional teeth whitening treatments. 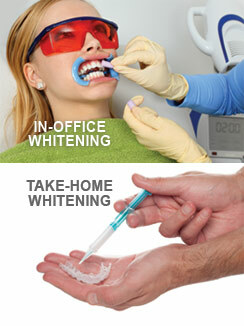 The in-office treatment consists of a single hydrogen peroxide gel treatment. The treatment takes approximately an hour, for virtually instant results. The at-home treatment involves a few more steps and the results are more gradual, but is a good option if you can follow through on the applications and prefer to apply the treatment on your own time in the comfort of your own home. This technique offers the fastest results with the most powerful whitening solutions available. First, your gums and tooth-root surfaces will be covered with a protective barrier to ensure your safety. A thin plastic device known as a retractor will hold your lips and cheeks away from your teeth as a professional-strength hydrogen peroxide gel is applied. The gel will be left on for about an hour. When it is removed, the results will be obvious immediately. This is another effective way to whiten your teeth, though you will play a greater role in ensuring the best possible results and several weeks may be needed to achieve your desired level of whiteness. First, a mold of your teeth will be taken and then two thin, flexible plastic mouth trays will be custom-made for you — one for the top teeth and one for the bottom. You will fill the trays with whitening gel and then position the trays over your teeth. The trays are left in usually for about an hour at a time. There are lots of things you can do to make sure your whitening results last as long as possible, and this will vary from person to person (six months to two years or even longer). First of all, please maintain your usual, conscientious routine of brushing and flossing every day, and keep up with your regular schedule of professional cleanings at Metro Dental Associates. Avoid foods and beverages that stain, including red wine, tea and coffee. If you smoke, use your newly whitened teeth as an impetus to quit — a good idea in any event! A minor touch-up every so often, either at home or at our Morristown, NJ dental office, can keep your smile bright and beautiful for years. call Metro Dental Associates at (915) 591-5333 today!